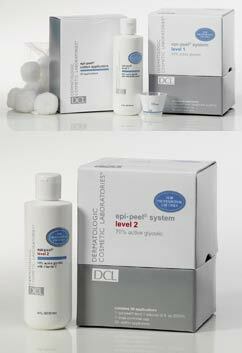 The first glycolic peel system specifically designed to offer physicians a more effective, efficient and predictable way to administer in-office glycolic peels. Willowherb Extract, at a clinically active level, helps soothe and calm the skin while the beneficial effects of the 40% active glycolic peel are taking effect. Controlled dose, concentration and timing provide reproducible & predictable results each and every time. Easy 3-step system makes procedure more efficient than ever before. Advanced level 1 (40% active) gel formulation provides easier, more even application. Available in 2 levels: level 1 (40% active) with willowherb extract. level 2 (70% active) includes the most effective topical anti-oxidant, Vitamin C, in a highly stable water soluble form- magnesium ascorbyl phosphate. The addition of this ingredient helps even skin tone and maximize efficacy of the glycolic peel. PREP Gently cleanse area to be treated with cotton ball partially saturated with DCL Skin Freshener until clean. NEUTRALIZE Thoroughly rinse treated areas with water. Gently pat dry.